Daisy has always been a farm dog, living outdoors with around 4 other dogs and having the run of the premises and outdoor fields for play and exercise. 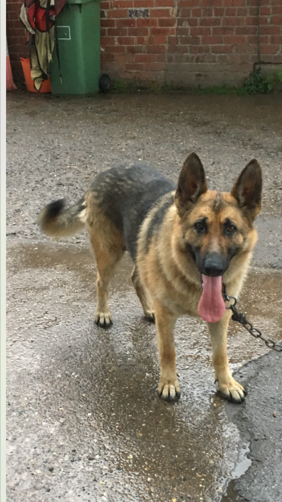 Although always found to have a high prey drive Daisy is now showing a more aggressive attitude towards other animals on the yard and sadly needs to be rehomed as owners feel her behaviour is not suitable to their environment and to keep all the animals safe Daisy is now chained up. Our volunteer found Daisy to be a beautiful shepherd who craves human attention and very happy to have a fuss and a belly rub. Not being formerly trained she wasn't sure how this dog would react to being walked on a lead but surprisingly she was very good and even walked passed a horse in the field and didn't bat an eyelid (therefore Daisy's current behaviour could just be wanting her own space)? Daisy could hear dogs barking in the distance and was alert but again when told just walked on. Our volunteer feels with some patience and continued training Daisy could easily turn into a fabulous family dog as she certainly loves people of all ages and size.